On yet another day that sees the news filled with horror stories and images of destruction, I hunt for a bit of diversion from the real-life world that shakes and screams and hurts and hates, something to let my head go in directions necessary to make progress on present work. In other words, to lift the clouds of gloom and feel the sunshine with little nagging guilt over just how bloody easy I have it at the moment. History can provide quite the perspective, so finding this story on Queen Victoria’s much younger man has caused quite the reroute in thinking on world reports through the mirror of time and more than a little sweetness. 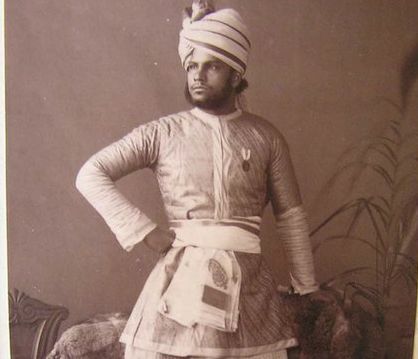 Mr Karim was just 24 when he arrived in England from Agra to wait at table during Queen Victoria’s golden jubilee in 1887 – four years after Mr Brown’s death. He was given to her as a “gift from India”. Within a year, the young Muslim was established as a powerful figure in court, becoming the queen’s teacher – or munshi – and instructing her in Urdu and Indian affairs. Mr Karim was to have a profound influence on Queen Victoria’s life – like Mr Brown becoming one of her closest confidants – but unlike him, was promoted well beyond servant status. “In letters to him over the years between his arrival in the UK and her death in 1901, the queen signed letters to him as ‘your loving mother’ and ‘your closest friend’,” author Shrabani Basu told the BBC. “On some occasions, she even signed off her letters with a flurry of kisses – a highly unusual thing to do at that time. Apparently, Karim was not on the Top Ten list with the rest of the clan, as he was given the royal boot out the palace doors within just a few hours of Victoria’s funeral, but although attempts were made to wipe the castle clean of all reference to him he had spent ten years with the woman, and he did keep diaries. Those diaries are on their way to becoming a book, and a fascinating read it’s bound to be. Not only do we have that cougar thing going, but the fact that the Supreme Governor of the Church of England was taking daily advice from a Muslim back in the days India was still part of the Empire is very interesting. No doubt, Victoria was one smart monarchial cookie, as under Karim’s tutelage she learned to speak, read and write both Urdu and Hindi, and I enjoy imagining the range and depth of conversations they conducted as they shared days, traveled the world and passed time in her remote highland cottage in Scotland. He was, of course, not the first younger man the “Widow of Windsor” had a thing for, the Scotsman, John Brown, having been her “personal servant” from shortly after Prince Albert’s death until the time of his. Well, what the hell? If you’re the Queen of the United Kingdom of Great Britain and Ireland and Empress of India, you’re going to pay attention to what others have to say about where your boyfriend beds down? I don’t think so … at least not in the days before tabloids and Twitter.